The Kills' Jamie Hince, anyone? 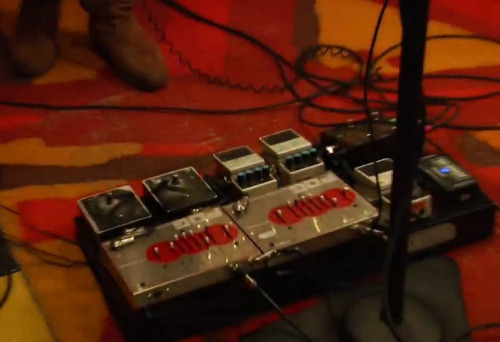 Discussion in 'Effects, Pedals, Strings & Things' started by Evens, Feb 8, 2012. I think he has a very unique approach to guitar playing, and I was wondering if anybody new what the hell is on his pedal board. pictures? infos? guesses? thanks in advance. Two POGs, Two DD-3's (or 5's), one for the fast, "stutter" repeats. Pretty basic, I think most of their sound is a result of their "percussive" style. Love 'em though! He gets his dirt from his Divided by 13 Amps. I think they're one of the RSA's but have never got a definitive answer. One of my favorite guitar players. wow, thanks! and what are the 2 black boxes on the left? fuzzes? also what's the other big box on the right? Probably an A/B switch on the right. I think some boxes trigger drum machines too. I know they use drum machines in their recordings. What do they do live? I've also seen a pic with a Divided head an a (4x10?) Fender cab. Really liking "Blood Pressures". Love the inventive guitar parts, especially the "cicada/jackhammer" sounds and all the fuzzy goodness. They use drum machines live as well. Sometimes they'll have some guys playing some percussion but I'm pretty sure it's mainly drum machines. Great band, great guitar player! He's definitely got a style of his own going on. I saw them around 2003, I don't think he had the /13 back then, I didn't see a drum machine, but saw him start what looked like a MD player for the drum/rhythm tracks when they started playing "Superstition" (1st song of the set). POG and delays were there, I was right in front of the stage so could see his board clearly. The amps were a Fender (maybe a Bandmaster, can't quite remember), and I think she had a Vox, but don't quote me on that. I do remember she wasn't playing through a Fender tho. God that was a great show, Spaceland in LA. Awesome place to see bands...just wish they'd make the smoking fishtank a bit bigger and less smokey. Awesome player, one of my favorite contemporary rock guitarists. His playing style reminds me a lot of old blues styles with that steady beat he plays with the melodic stuff. This was right after their first record came out, so maybe Jamie didn't have the bucks or hadn't met Fred and his amps yet. I tried to figure out where the drums (and other samples) were coming from, but I assume he has some electronic instruments wherever he makes his samples. They would lose something for me if they got a real drummer...I love the fullness of sound they get with just two people and two guitars. The Kills influence my guitar playing quite a bit the last couple years and I hope to one day meet my Allison to complete the duo. I was so happy the day I found out they weren't dating (like I have a chance)...I mean come on now, the way he looks at her sometimes... It's like he's saying "Any of you dirtbags touch her, and yer dead!" w/o saying anything. Alison was a student of mine...amazing girl and phenomenal artist. We still keep in touch and talk music and art! Great sounds coming from that pair. I have a major league crush on Alison. What the hell is up with his POG's? He has cables patched in where the foot switches should be.... maybe the 2 black boxes are the foot switches for the POG's? I just can't figure out what's going on there. What do ya'll think? I can't remember where, but I do remember reading somewhere that the black boxes ARE foot-switches for the POG's because he would always accidentally kick the sliders when playing live.